Yes. We were in the middle of the snow storm that blanketed the mid-west this week. We were out of school for three days. Two because of snow - one because of COLD. We got about 81/2" of snow at our place - but after the snow came the wind - and drifting. There were some crazy drifts and LOTS of snow. I love how peaceful and clean everything looks right after a snow storm. This one is of our front steps. YAY for the hubby who went out and shoveled more than once and for our fabulous neighbor who loves to use his snow-blower! Thanks Mike! This is at our church. 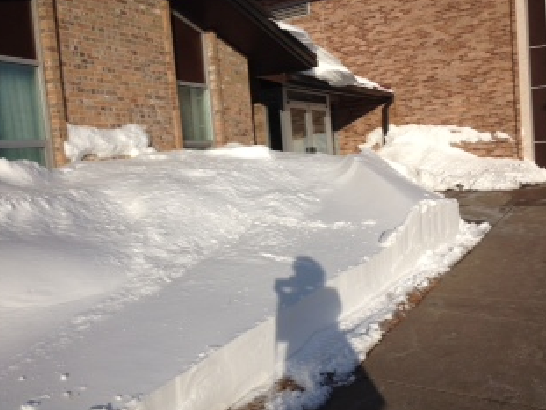 Yes, there are bushes up against the building, but seriously - look at all of that snow! 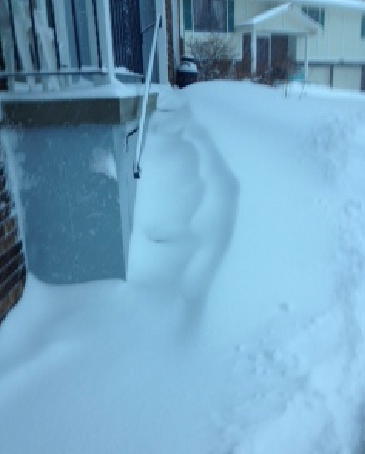 A drift out our front door. The snow was so heavy on the bushes and trees. Another shot of our deck and back yard.